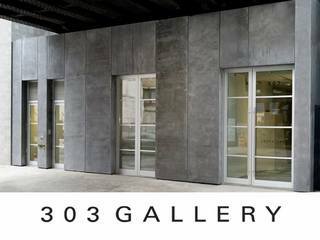 303 Gallery was first established by owner and director Lisa Spellman in 1984 at 303 Park Avenue South. In addition to its address, the gallery name also references Alfred Stieglitz's "Intimate Gallery" artists-collaborative located in Room 303 of the Anderson Galleries building. Spellman's 303 Gallery moved to the East Village in 1986 where she invited such artists as Christopher Wool and Robert Gober to curate special artist projects and collaborations. 1989 marked 303 Gallery's move to 89 Greene Street in Soho where Vito Acconci, Andreas Gursky, Larry Johnson, and Rirkrit Tiravanija had solo exhibitions. It was on Greene Street that Spellman initially exhibited Doug Aitken, Hans-Peter Feldmann, Rodney Graham, Karen Kilimnik, and Collier Schorr. In 1996, 303 Gallery was among the first galleries to move to Chelsea, opening at 525 West 22nd Street and subsequently moving to 547 West 21st Street in 2008 and to 507 West 24th Street in 2013. In 2016 the gallery will open its new location at 555 West 21 Street in a building designed by principal architect Norman Foster + Partners.